When temperatures dip into the single digits, we need to take the following precautions to ensure the safety and well-being of our pets. In cold weather, cats allowed outdoors may climb up inside the hood of a car seeking warmth and shelter. This can lead to injuries or death when the engine is started. To prevent these incidents, keep your cat indoors at all times. 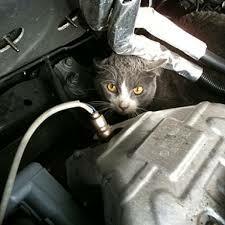 To protect stray cats, knock on your car’s hood or sound your horn before starting the vehicle in cold weather. Snow and ice increase your animal’s chances of becoming disoriented and lost if roaming the streets. In addition, bad weather conditions make it difficult for cars to stop, increasing your animal’s chance of getting hit. Keeping your pet indoors and walking your dog on a leash will prevent such tragedies. Jagged ice and sidewalk salt can injure or irritate your dog’s foot pads. After you return home from a walk, check the foot pads and wipe off any salt or ice with a damp towel. 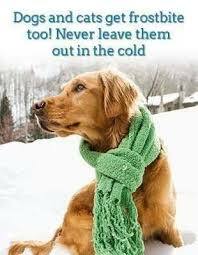 Also, make sure you thoroughly dry off your dog whenever he or she comes in from the snow. Even though companion animals have a fur coat, most cats and dogs cannot endure the cold of winter for more than 10 to 15 minutes. A companion animal left outdoors can get frostbite and even freeze to death. Pale skin that is cool to the touch is the primary sign of frostbite. If you suspect frostbite, gently apply warm--not hot—water, and then take the animal to your veterinarian. After thawing, there may be pain or redness on the frostbitten area. Once an area has been frozen it becomes more susceptible to cold and frostbite. Animals are attracted to this substance because of its sweet taste. It can be fatal if ingested, so keep all bottles of anti-freeze out of your companion animal’s reach. Be sure to immediately clean up any spills in your garage or driveway. If your cat or dog swallows anti-freeze or any other poison, contact your veterinarian immediately. Animals tend to shed less hair during the cold months, but they still require regular brushing. Since they clean themselves, cats generally do not need a bath, and dogs should be bathed only if it is needed. When bathing any animal, be sure to only use a shampoo that is specifically safe for a cat or dog and to follow the label directions. Mistletoe, holly, and poinsettias are all poisonous to pets. However, there are many other common potential hazards that your pets may face around the holidays relating to Christmas trees, decorative lights, and more. Cats should be kept inside at all times, year-round, to protect them from the many life-threatening dangers always present outside. Dogs should also live inside, but since most dogs need to go outdoors to eliminate, make sure that your dog’s time outdoors is as brief as possible. If your dog spends a lot of time outside, you are required by law to provide adequate shelter. A proper doghouse must be windproof and watertight, with a floor elevated off the ground, and just large enough that the dog is completely comfortable in any position. Bedding, such as straw, will also help insulate the shelter. Make sure your pet has plenty of fresh, clean water in a secure, non-tip dish at all times. Check the water bowl frequently to make sure that the water hasn’t frozen. It shall be unlawful for any person in possession of an animal to fail to provide it with sufficient good and wholesome food and water, proper shelter and protection from the weather, veterinary care when needed to prevent suffering, and humane care and treatment. Food shall be of the quantity and quality necessary to maintain the normal body weight according to the species and bone structure of the animal. Water shall be reasonably clean and, depending on weather conditions, provided at intervals to make it available for drinking at all times. It shall be unlawful for any person to abusively tease, molest, or bait any animal. It shall be unlawful for any person to entice or lure any animal out of an enclosure or off the property of its owner or keeper.